This business plan serves as an excellent model for long-term and large-scale expansion for a small, self-owned business, as well as how spirituality and business practices can be successfully combined. The exposure to and knowledge gained from tradeshows complement the ultimate ambitions of the entrepreneurs and past success so as to create an optimistic forecast. The plan is also strengthened by the assessment of the competition. The mission of Scriptures For You, Inc. is to create and provide quality products which reinforce Christian values. Scriptures For You, Inc. is a manufacturing company founded by Martha Smith in December of 1990. Struggling with commercialism during the Christmas season, Albert (Martha's husband) knew a change was needed in the way Christmas has been celebrated. He expressed his concerns and directed them towards the Christmas tree. In wanting to keep the tradition of the tree, Martha developed a scroll type ornament on which various Bible verses were written. Today the company has two patented products. The first patent was issued on February 14, 1996 and the second patent is expected soon. Scriptures For You, Inc. is a sub chapter "S" corporation with authorized stock of 60,000 shares, of which Albert and Martha Smith own 51%. There are currently 18 shareholders. A meeting was held on November 7, 1996 to introduce the company to the Bay City community and to look for potential investors. Stock was offered to raise capital to finance the 1997 Marketing/Business Plan. According to company by-laws, this stock has to be offered first to current shareholders. Scriptures For You, Inc. was founded in 1990 and incorporated in 1995. Currently a line of ornaments is being manufactured and a variety of quality products are being developed. In addition to scrolls for Christmas trees, scrolls are being added to new floral arrangements. The wedding scroll will be displayed in an attractive wedding card/box which can be converted into a frame for a favorite wedding photo. Our vision is to offer our scrolls in a variety of languages, exporting them to different countries. By the end of 1998 we would like to open our first all-year "Holiday Heaven" store here in the Bay City area with the possibilities of branches around the country. The scrolls would be sold along with specialized products geared towards the Christian perspective of the holidays. By 1999 we will have our own mail-order catalog with products tested in "Holiday Heaven." We are currently a sub chapter "S" corporation with 18 shareholders. Martha Smith is the president of the corporation with Albert Smith the secretary/treasurer. The board of seven directors controls the corporation. Our mission is to create and provide quality products which reinforce Christian values. The present and overall goal of Scriptures For You, Inc., is to create and offer products which reinforce Christian values. The scroll products have great potential to be directed to different markets depending on the way they are used. Our current marketing methods consist of using all-year Christmas stores, gift, craft, floral and hospital gift shops, Christian bookstores, direct marketing, mail-order catalogs, speciality magazines, distributors, and sale representatives. Our products are new and unique to the market and made with the quality one expects when purchasing an American-made product. After extensive marketing research it has been found there are no other products like ours on the market, thereby giving us the opportunity to obtain two patents and an unlimited market. As far as product development is concerned, specialized scrolls are currently being added to our line, including scrolls for the Girl Scouts of America and DeColores scrolls pending approval from the companies who have requested them. We would also like to have available for sale our new product: the Wedding Scroll/Card. Bronner's Christmas Wonderland became our first customer in 1993, selling our scrolls for $4.95 each. Bronner's has consistently reordered from us over the past four years, selling 3,765 scrolls. As in the past, we continue to add new accounts to our database. The marketing knowledge gained this year has helped open the door to many different ways of marketing our product and has helped provide an understanding of the time of year that different sellers do their buying. In January, the all-year round Christmas stores and major chain stores do their Christmas shopping for the next Christmas season. Gift stores begin to look for new products around March and Christian bookstores start looking around June and July. By the end of August most of the Christmas buying is over. In 1997 our goal is to continue with an aggressive marketing campaign including a television advertising campaign. The profit margin is higher when we direct market the product ourselves. Therefore, it is our decision to apply our energies to the area of direct marketing, including being set up on the Internet as of January 1997. Professional photographs for brochures will be mailed out to different targeted markets during their buying season. Pathways, located here in Bay City, has the capability to assist us in our mailing at a very reasonable cost. Using Sprint's "Friday Free Phone Calling" program, we will be contacting stores all over the United States in order to expand our customer base. At this time we are working with The Works and John MacDonald as our sales representatives. The Works is homebased in Philadelphia, Pennsylvania and provides us with 45 road representatives. John MacDonald has 6 representatives and displays our products in two of their permanent showrooms. One of the showrooms is in Plymouth, Michigan and the other one is in Fort Wayne, Indiana. Exporting our products to different countries will become a reality after attending a seminar in Chicago, with Brazil being the first to receive our Portuguese scrolls. This seminar will last for 6 months with a goal to ultimately set us up in an international trade show. In May of 1997 we would like to attend the Spanish trade show held in Miami. We will continue to gather pertinent information for trade shows to be held in 1998. In 1998 we are planning to open our first "Holiday Heaven" store in the Bay City area. In keeping with the overall goal, this store will specialize in merchandise geared for all holidays, but from a Christian perspective. In 1999 we would like to begin the year with a comprehensive mail-order catalog of products tested in our "Holiday Heaven" store. A long range marketing goal is that of establishing a chain of "Holiday Heaven" stores throughout the country. 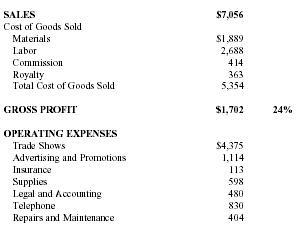 Funds are needed to accomplish our goals outlined in the 1997 marketing plan. Ten thousand shares of stock are currently being offered. Six months of aggressive marketing will enable us to achieve our sales projections. In turn, this will benefit our Bay City community by adding new jobs and patronizing local businesses. Martha Smith, president of Scriptures For You, Inc. has experience and strength in the areas of product development, marketing, and sales. As a manager of Tupperware Home Parties for 10 years she was responsible for training and motivating dealers. Also, she worked for the U.S. Navy in graphic arts and has taken advanced courses in the area of art/graphics. Her salesmanship and creativity, in addition to her willingness to persevere and educate herself in all areas of the company, make her an asset to Scriptures For You, Inc. When production meets the projected goals Albert Smith is to take on the responsibilities of bookkeeper/production manager. Albert has kept the books for the past three years and is familiar with the work required to meet the demands of the business. Albert has over fifteen years experience in the accounting field and is now working at CEI Instruments and Costco, where he is gaining production and retailing experience. The corporation's lawyer is Walter Warner. 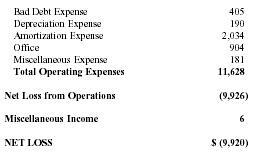 At this time Albert Smith handles our tax and other financial reports. The Board of Directors, which meets regularly, contributes in great part to the growth of the corporation through their advice and counsel. In 1994, Scriptures For You, Inc. ran a prototype assembly line after receiving an order for 10,000 scrolls from Martindales, a distributor in South Bend, Indiana. Management was able to accurately determine the cost of materials and labor required for production of scrolls at that time. A production line is planned consisting of eight people with the ability to produce approximately 2,000 units per week. A supervisor for each line would be responsible for production and product quality. All necessary training and skill development are learned on the job. The work hours are to be flexible based upon each employee's family needs. This coming year, as the orders come in, production lines are to be set up to meet the demand. In May of this past year we hired two employees to produce our scrolls. They work approximately 40 hours per week in the window at the Heavenly Roads bookstore. We subcontract out the actual burning of the scroll. We currently have on hand 1,925 completed scrolls with enough raw materials to produce an additional 1,250. We have created a way to increase the value of our irregular scrolls by adding holly leaves to them or by incorporating them into floral arrangements. This not only minimizes the number of irregulars but also maximizes our profit. As much as possible, Scriptures For You, Inc. purchases our raw materials from local suppliers. Our new floral line will be coming from a cooperative arrangement with two of our local florists. The past three years have been spent building a solid foundation for Scriptures For You, Inc. In 1992 the scroll was developed, being made ready for market in March of 1993. Bronner's of Frankenmuth, Michigan became our first customer. In 1994 a production line was organized making 10,000 magnet scrolls for Martindales. The year 1996 has been spent in the area of marketing and capital formation. For next year, 1997, it is anticipated that work will continue in all three of these areas: product development, production, and marketing. Reviewing the year's marketing milestones, 1996 began with raising capital in January so we could attend two major trade shows. In the beginning of February we went to Atlanta. It was there we got a taste of the national market. We were approached by several representatives. President Smith gained much knowledge in marketing strategies. After returning from the trade show, scrolls were mailed to some of the key accounts on the Christian market to increase product visibility. In March we went to the Nashville Gift Show. Storeowners were encouraged to place their orders early by offering them 90 day billing from date of shipment. At the end of April the investors were contacted and our first meeting was scheduled for May 7 to review the outcome and possibilities from the trade shows. We signed on with The Works. Small Wonders agreed to pick up our line in their Christmas catalog. John MacDonald wanted to put the scrolls in their permanent showroom in Plymouth, Michigan and in Fort Wayne, Indiana. Monthly meetings with the Board of Directors and lots of paperwork became a reality. The rest of the year saw continued development of the corporation. In the middle of May we hired our first employee. A scroll stand is being developed to encourage stores to pick up scrolls as a year-round product. We came up with a new way to package the scroll for stores who take their merchandise out of the original package. We applied for our UPC Code and by the end of June had company by-laws. In August, a craft magazine featured our scrolls in their catalog through which we have received 39 inquiries to date. By September we were working on professional photographs for 1997 brochures. A new sticker was designed for our magnet line and we are currently preparing a Portuguese translation of the product and its packaging. Prototypes for the Girl Scouts of America and a DeColores scroll have been developed. We have also been looking at the possibility of adding a floral line which two of the floral shops located here in Bay City, are collaborating with us. As of October we acquired a computer, fax, and small Xerox machine. On November 7 , the company was formally introduced to the Bay City community. Stock was offered to raise capital to finance the 1997 Marketing/Business Plan. It was with commitment and creativity that the scroll was perfected as it is today. The experience gained working with a production line in 1994 has prepared us for a smooth transition to mass production when the opportunity presents itself. The marketing knowledge obtained this past year has opened the door to the many different ways our products could be marketed. Most importantly, Scriptures For You, Inc. plans to offer ever expanding lines of products which reinforce Christian values. 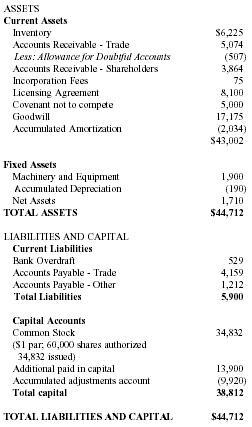 I have prepared the following balance sheet, dated September 30, 1996, and statement of income and expense for the nine months ended September 30, 1996 for Scriptures For You, Inc., using the accrual method of accounting and following generally accepted accounting principles. These statements have been prepared from the corporate books and records only and have not been independently verified by any other entity. The current marketing plan is an aggressive approach to increase sales, and the following projections are a reflection of what management believes will happen with the implementation of this plan. The goal of management is to triple ornament sales in each of the next 3 years. There is a realistic premise for these projections given the many potential sales outlets and combination product sales now being pursued. 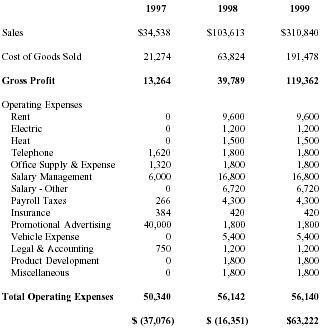 The breakeven analysis computed is for the operation in full operation as shown in the 1998 projected income statement. That analysis shows that sales would have to be at 4,070 units per month or 48,840 units per year to break even. Management believes that can be obtained in 1999. The projected shortfall for 1998 will have to be addressed through cuts in projected expenses, additional capital from shareholders, or possibly a short-term loan. The 1997 projection shows the immediate effect of the projected marketing plan. This loss will not be offset until later years of profitability, beginning with 1999. 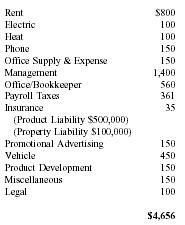 We show here the full amount of the projected cost of the 1997 marketing plan, however, we will only spend on marketing those amounts we receive in new capital. Secretary/Treasurer, Scriptures For You, Inc.